For travel junkies like me, there’s nothing that feels more gratifying than seeing an iconic sight that you’ve been itching to lay eyes on. 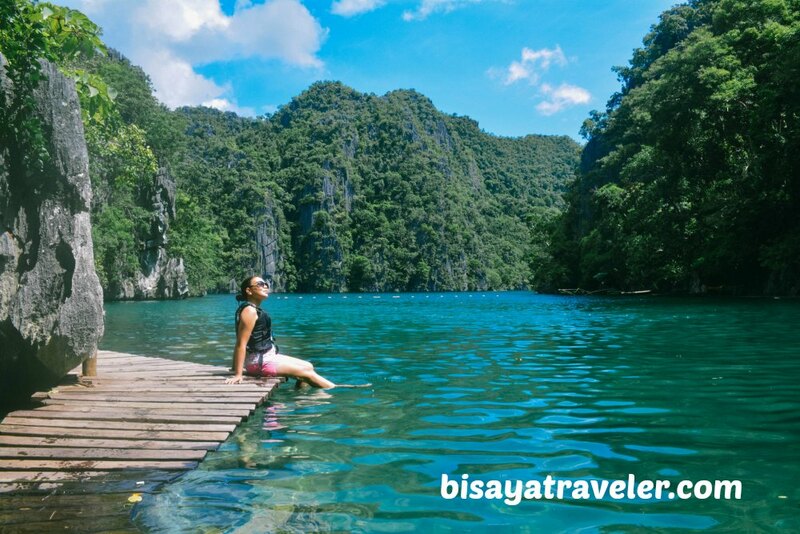 For over a year, Kayangan Lake, billed as the “cleanest lake in the Philippines”, has been luring me with its crystal clear turquoise waters and towering karst limestone cliffs. 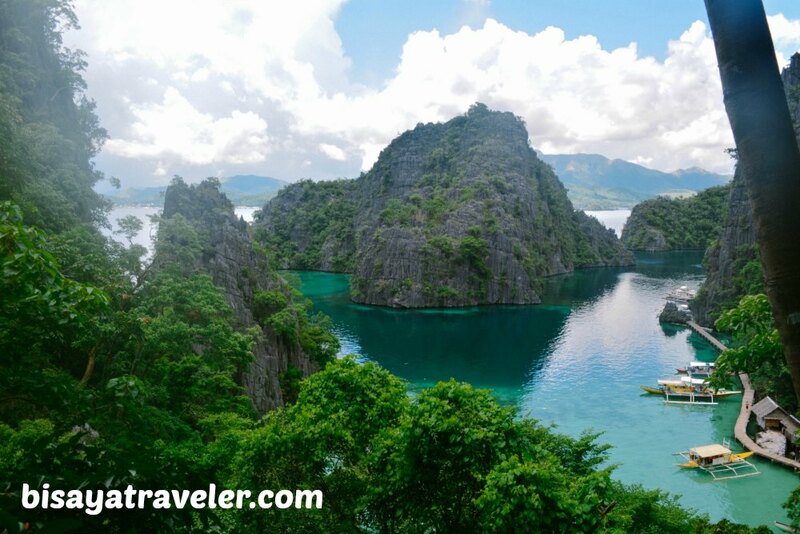 From award-winning travel blogs to Instagram, I’ve seen a deluge of jaw-dropping images of Coron’s undisputed treasure. And when I finally got the chance to see it, I cherished it thoroughly, taking in its spectacular, spellbinding scenery. After seeing it in person, I can honestly say it’s by far one of the best and most photogenic attractions in the Palwan, Philippines. Trust me, it’s as stunning as the postcards and photos of it you see online. 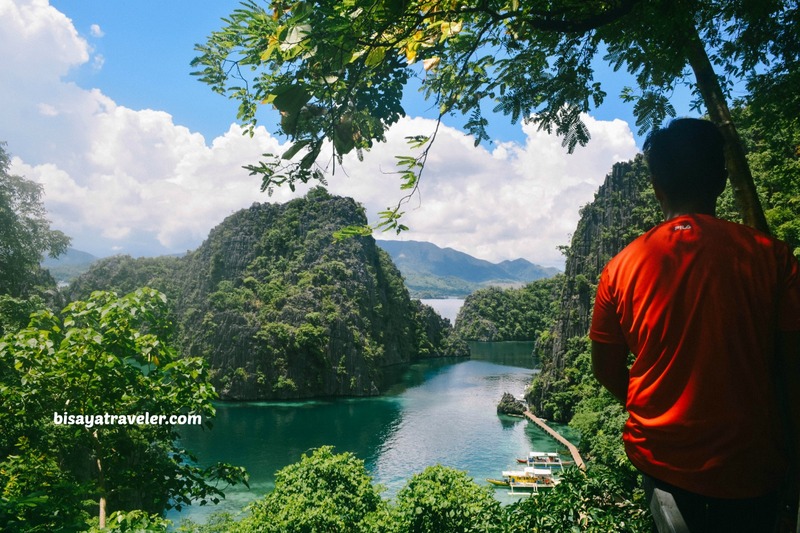 And the best part was, Kayangan Lake was just a stop and one of the highlights of our fun-filled island hopping tour in Coron. 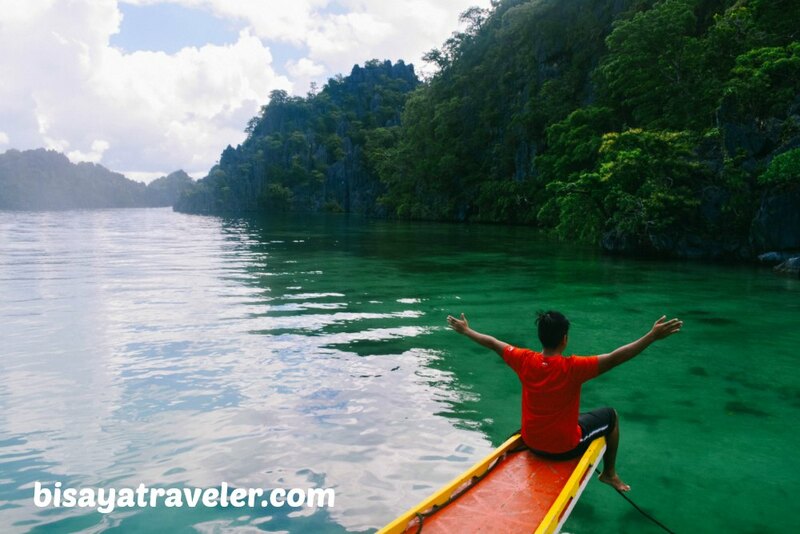 With its magnificent rock formations and gorgeous waters, our island hopping tour in Coron was quite a fascinating trip brimming with beautiful natural sights. Just like our 1st day in Coron, we have a little problem communicating with our tour operator. I guess that’s what happens when you confuse your tour operators and pick-up service by switching hotels. Eventually, though, we got everything sorted out, thanks to the hard-working men and women in Lualhati Park. 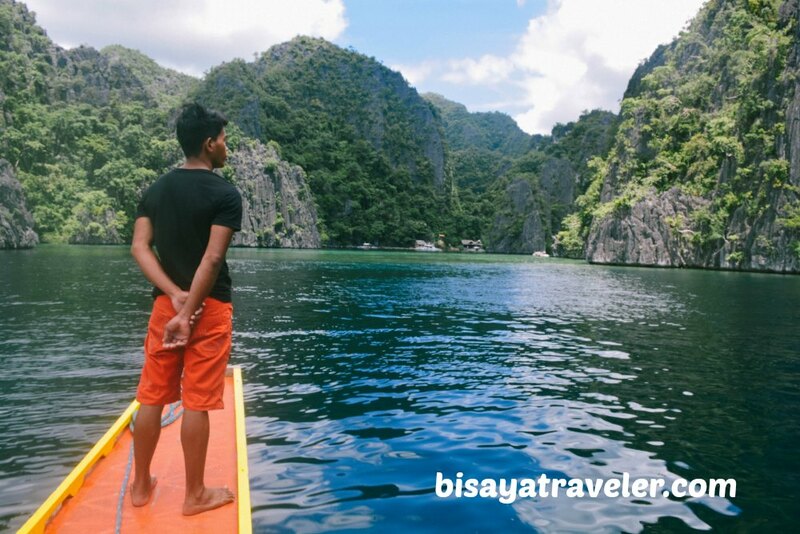 And to make things even better, we were all about to join a bunch of other Cebuano travelers and tourists for our Kayangan Lake visit and Coron island hopping tour. Don’t get me wrong – I don’t mind traveling with Tagalogs and other nationalities. As a matter of fact, I even prefer to travel with people from other countries because it can be quite an insightful experience to learn from other’s culture. But the thing is, I feel like a different person, when I’m talking in my national language – Tagalog. In the words of many wise men in history, your personality changes, as you speak another language or dialect. Every time I talk in Tagalog, my vibe transforms into an overconfident, swaggy dude. And, when I speak and write in English, I feel like an incredibly intelligent biographer who’s on top of the world. But, whenever I’m talking in my native tongue, I feel very much at home since I can be as quirky and eccentric as I can be. Even without formal introductions, everything was clicking for the group from the get-go. And yes, they were just as excited as I am to hit Kayangan Lake and the other natural wonders of our Coron Island tour. A few minutes after embarking on our Coron Island hopping tour, we arrived at our first stop – CYC (Coron Youth Club) beach. With its pristine white sands and clear waters, the CYC beach by far epitomizes the stunning beaches of the Philippines. I took photos of CYC beach with my wife as the model, and later on, took a plunge on its inviting waters. I was on euphoria, as I was swimming and snorkeling in CYC beach. Plus, I felt so relaxed and free, with the salt water relieving me of my muscles aches and daily stress. As they say, salt water heals everything. My wife, however, told me that the best has yet to come, with the Kayangan Lake and other stunning spots still scheduled for later. We didn’t spend a lot of time in CYC, and made our way to our next destination – Blue Lagoon. The moment we arrived at Blue Lagoon, I was utterly amazed by its beauty, which honestly was just a teaser of the trip’s main event – Kayangan Lake. After snapping a couple of shots, I and Mrs. Bisaya Traveler indulged on the cold and soothing waters of Blue Lagoon. To me, it was arguably the most relaxing moment of our couple trip in Coron. Then, we hopped aboard our boat, and went for a short ride to the small, but lovely Banol Beach. Along the way, we were treated to some outstanding views of Coron’s iconic postcard-worthy limestone rocks. As I was gazing at these striking natural features, I couldn’t help but wonder how these islands and rocks were formed. Heck, I even did a thorough research about the rock formations of Kayangan Lake and its nearby islands, once I got home. From what I’ve learned, these limestone rocks were formed more than 250 million years ago as a coral reef, and were part of the China Continental Crust. Soon after, it moved to its current location – north of Palawan – in the aftermath of a series of tectonic movements. 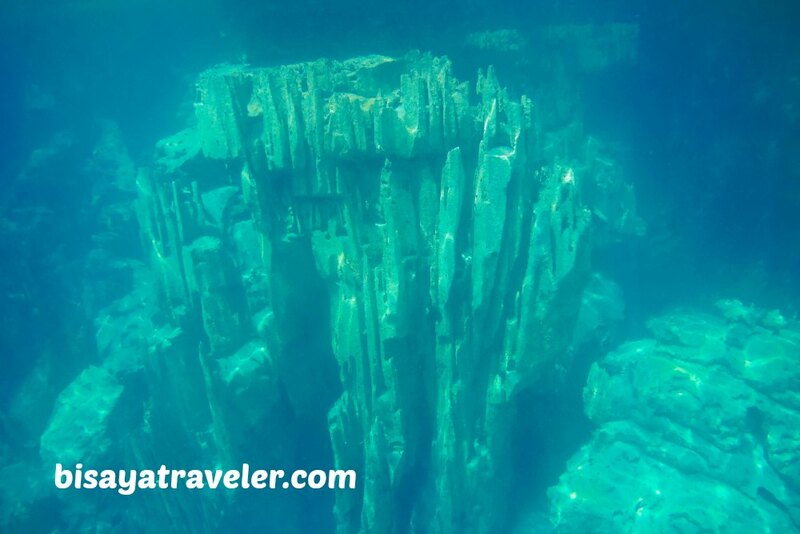 About 200 million years later, these extraordinary formations were uplifted by another tectonic movement. Afterwards, they were perpetually eroded by monsoon rains and waves, creating its current breathtaking karst topography. 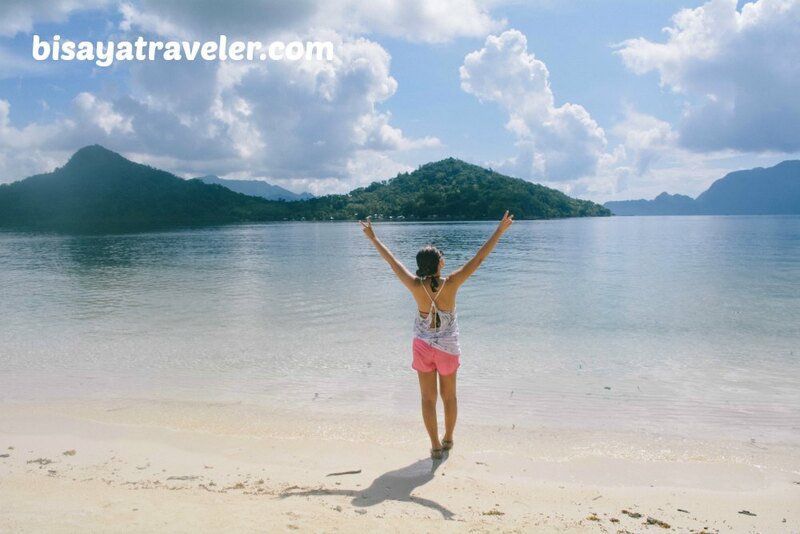 Ultimately, we arrived at the third destination of Coron island hopping tour – Banol Beach, where we ate our lunch, and enjoyed a swim. Once lunchtime was over, we went back to our boat, and made our way to the main event of our day tour – Kayangan Lake. I can sense everyone’s excitement, on our way to Kayangan Lake. Some even said that they traveled all the way to Coron from Cebu, just to catch sight of Kayangan Lake. And the buildup to Kayangan Lake was nothing short of awesome. With its eye-catching waters and dramatic cliffs, the ride leading to Kayangan Lake was a great way to pump us up. I couldn’t resist the urge to take pictures of the entrance to Kayangan Lake with our tour guide unintentionally as the model. In fairness, the guy looks like a bona fide travel blogger, with his talikogenic pose. Upon our arrival, we wasted no time, and hit the paved pathway to a beautiful lookout in Kayangan Lake. The hike up wasn’t really as difficult as most people think. My wife, who’s not much of a hiker, didn’t have any problems climbing the concrete stairs. But, make no mistake about it – the hike can be tiring, if you’re not used to trekking and exercising. As you might have expected, we were the first pair to reach the famous lookout point in Kayangan Lake. And the view from up here was simply adorable and jaw-droppingly beautiful. I know the view is a bit cliché for some, but nobody can deny and resist its mesmerizing grandeur. A few minutes later, everyone in the gang arrived in the scene, and was also enthralled by its vista. We did spend a lot of time in this part of Kayangan Lake, just cherishing the scenery and snapping a plethora of photographs. Truth be told, the Chinese tourists were slightly annoyed at us because we spent so much time admiring the charm of Kayangan Lake from this vantage point. We, then, descended to the other side of Kayangan Lake, to enjoy a refreshing plunge on its clear and gorgeous waters. As far as I’m concerned, Kayangan Lake was just as good or even better as hyped. 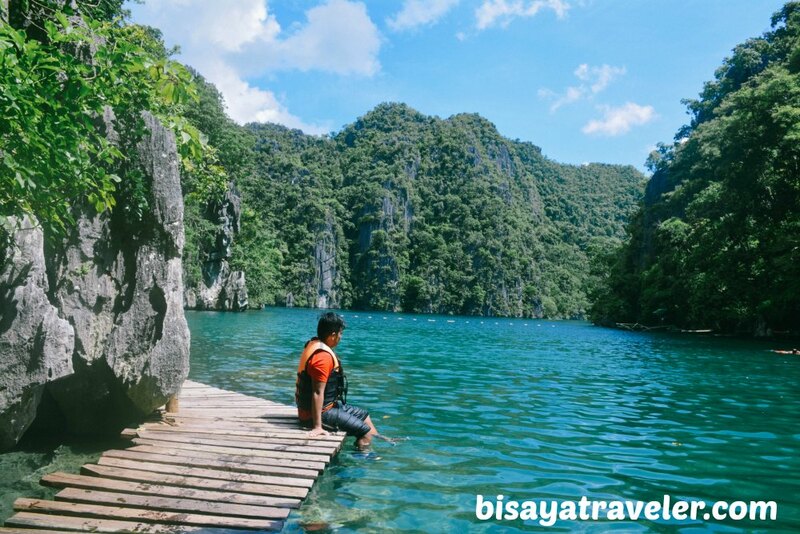 With its fine mix of saltwater and freshwater, Kayangan Lake is truly a perfect place to swim and admire the beauty of Coron. 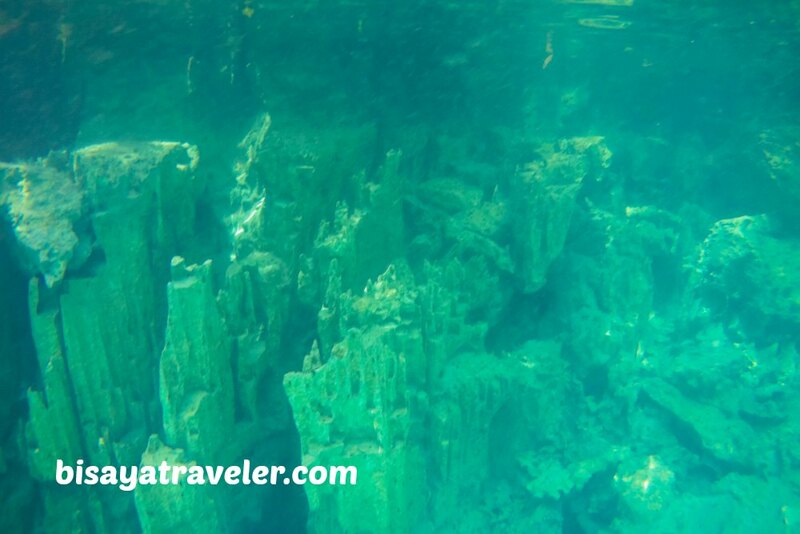 Plus, the water is so amazingly transparent that you can see the splendid limestone formations under it. As we were swimming in Kayangan Lake, my wife told me to grab my outdated SJ4000 Cam with its dome, to get a unique perspective of the place. As with most loyal husbands, I obliged with my wife’s request. 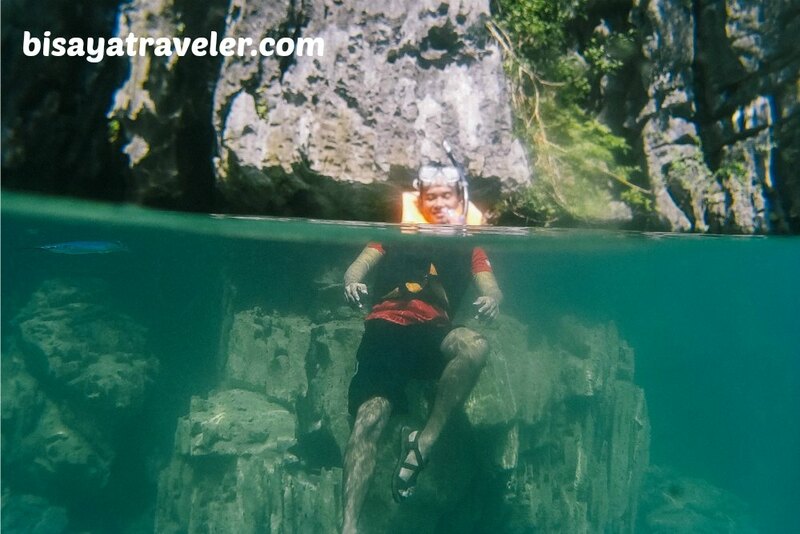 We snapped a ton of photos of Kayangan Lake with my pair of SJ Cams – SJ6 and SJ4000. While taking pictures, we finally met formally the other members of the group in our boat. As it turned out, we had a friend in common, Jester (shout out to my old buddy, dude), who happens to work with some of them in Lexmark. As much as we liked to stay in Kayangan Lake, we had to moved on, and cap off our trip. But, before leaving Kayangan Lake, we had to take a few more photos of this spectacular natural wonder. With our cameras filled with rather nice photos, we headed to Siete Pecados – our final stop of our Coron island hopping tour. 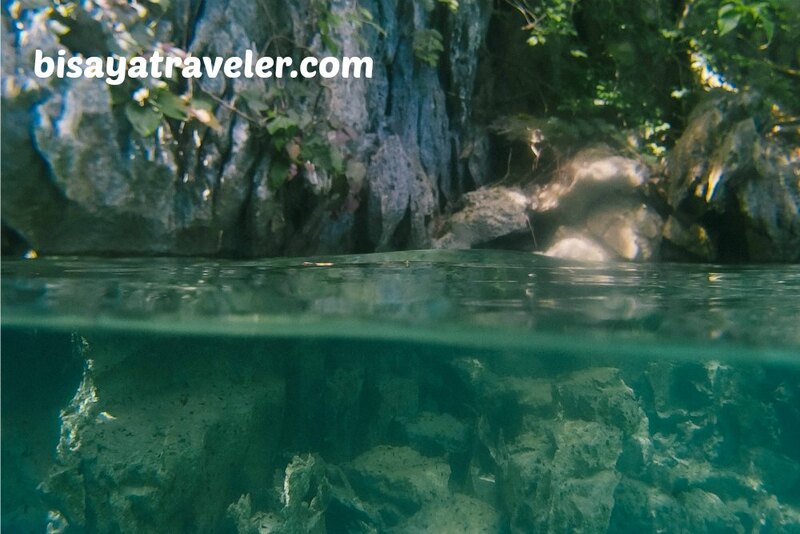 According to our guide, Siete Pecados is famous across Palawan for its diverse marine life and lovely corals. 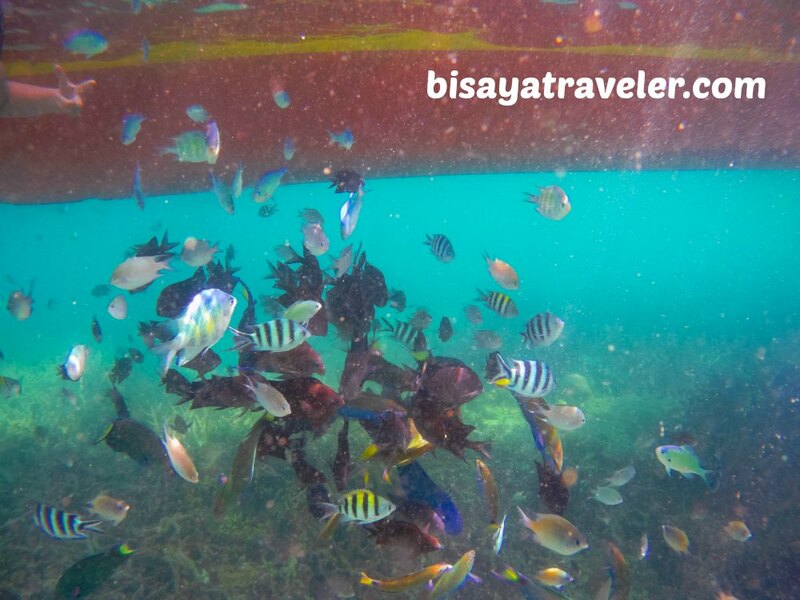 Honestly, the site’s underwater life isn’t as wondrous as Moalboal’s Pescador Island and Sardines Run. Still, it’s a great way to end our Coron ultimate tour on a high note. From there, we went to back to Lualhati Park, and took a boat ride to our one-of-a-kind resort – Coron Underwater Garden Resort (I’ll write about this one later). Practice the LEAVE NO TRACE principles. 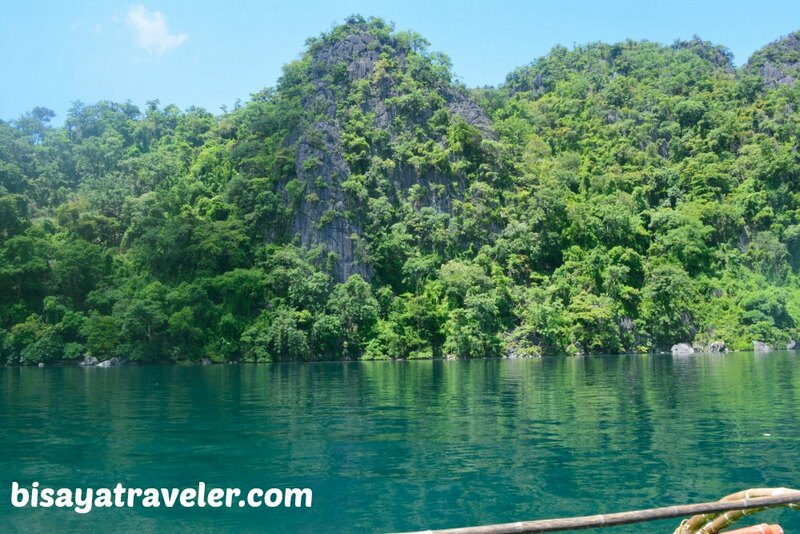 Island tours in Coron vary, when it comes to prices and destinations. 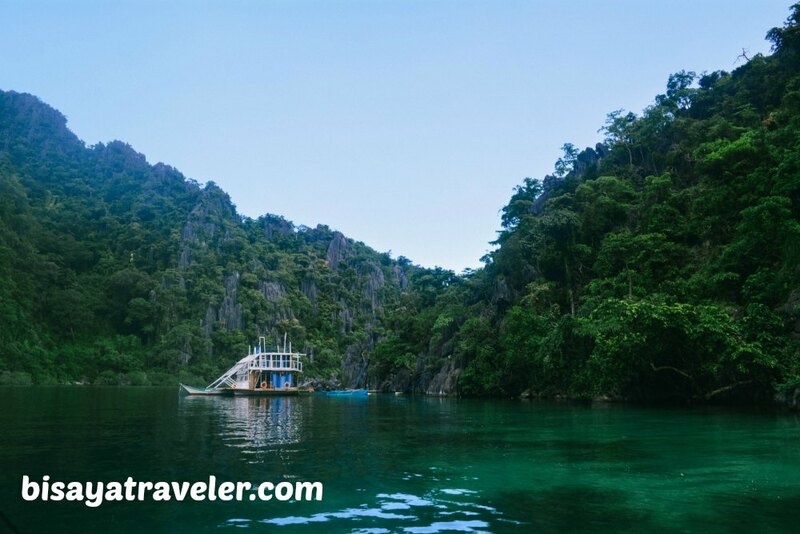 Contact Tickets To Ride through their Facebook Page, to get the best deals for tours in Coron. 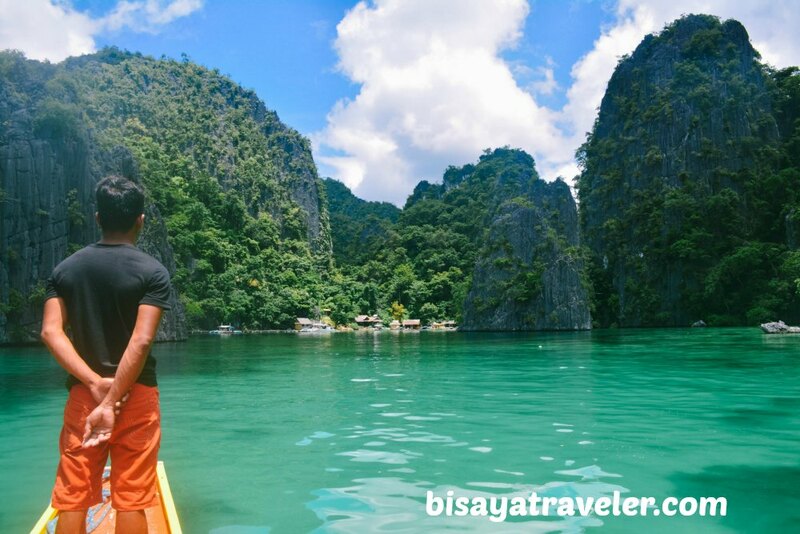 Normally, this kind of island hopping tour costs around PHP 900 to 1,500 per person, with a few inclusions like life vest and lunch. Bring your own snorkeling gear (if you have one). Snorkeling gear rentals costs PHP 150 per set for the whole duration of your trip. Although recommend, there’s, to me, no need for you to buy a dry bag or a pair of aqua shoes for your island hopping tour. 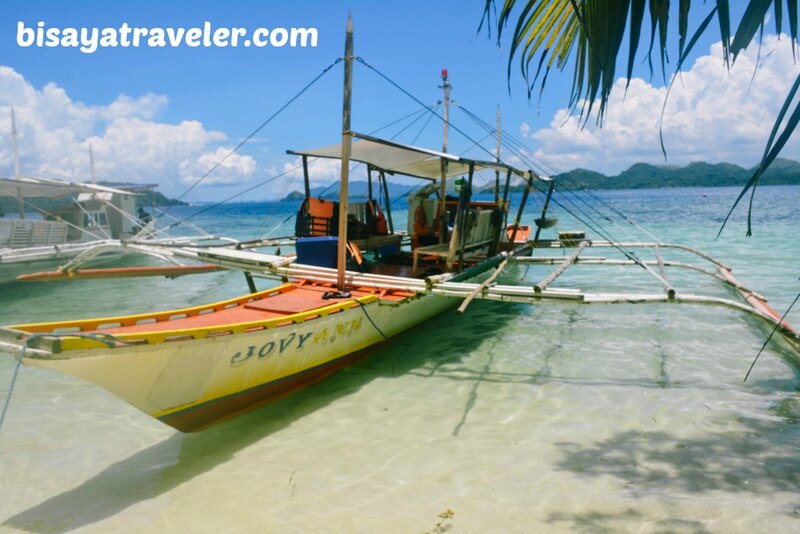 Island hopping tours in Coron usually start at 09:00 AM and end at 04:00 PM. Bring snacks and at least a liter of water. 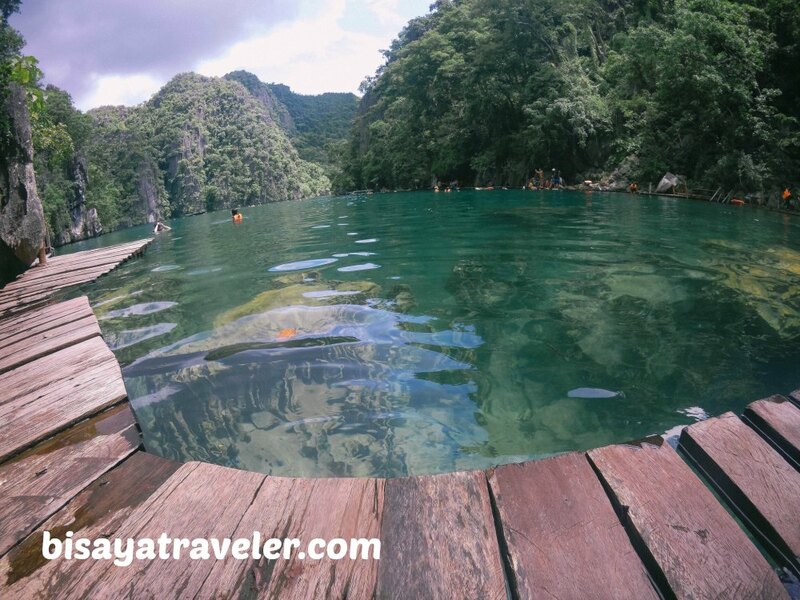 Tone down your voice, as you swim around in Kayangan Lake. Locals don’t like it, when it tourists are noisy.